First lady Melania Trump has been planning for months for what will be the first official state dinner at the White House in honor of French President Emmanuel Macron and his wife, Brigitte. So confident was Trump about her ability to handle something like a state dinner, with its myriad details, that the first lady would not hire an event planner to help, as previous first ladies have done in the past to manage the grandeur and spectacle. For example, the final state dinner of the Obama administration, its 14th, was a tented affair for former Italian Prime Minister Matteo Renzi, held on the South Lawn of the White House for 400 guests. Michelle Obama wore a custom, chainmail Atelier Versace gown; Mario Batali cooked, and Gwen Stefani entertained. For the Trump administration’s first state dinner, there will be none of that. There will also be none of the paparazzi element that has come with past state dinners. Stephanie Grisham, the first lady’s communications director, told CNN about Trump’s approach when planning the event. 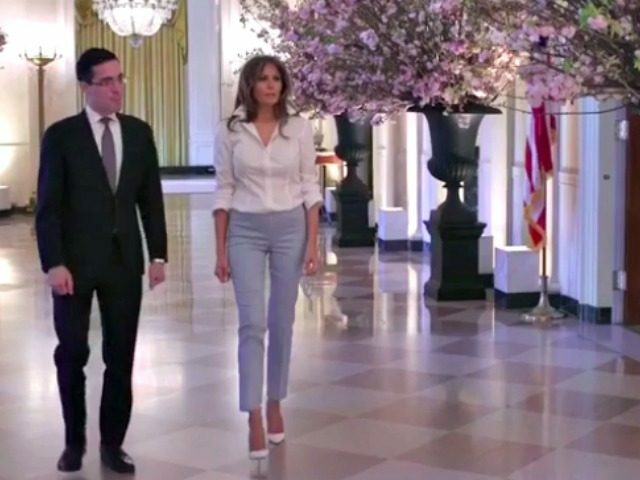 “A smaller, more elegant event allows a guest to have a more personal experience, and that is very important to Mrs. Trump,” Grisham said, adding that the dinner will take place in the State Dining Room, which has a maximum occupancy of 150. As for the traditional gift exchange between heads of state, the Macrons will be given a framed swath of French fabric used in the White House. “Featuring a golden eagle surrounded by laurels, the chair was part of the furniture suite inspired by Pierre-Antoine Bellangé, who designed royal palaces in France and created the 53 carved and gilded pieces for the Blue Room, which he was commissioned to create by President James Monroe,” CNN reported. Another gift for the Macrons, according to CNN, will be a photo album featuring their visit and a Tiffany & Company silver bowl with the U.S. presidential seal, signed by the first lady and President Donald Trump. The Macrons will reciprocate by giving the Trumps a European sessile oak tree native to the site of a World War I battle in Aisne, France, where about 10,000 American troops were killed or wounded. The tree will be planted on the South Lawn of the White House. When King David Kalakaua of the Kingdom of Hawaii visited Washington, DC, in 1874, there was no guide for how President Ulysses S. Grant should welcome him. The White House had never hosted a foreign head of state—Hawaii would not be annexed by the United States until 1898—largely because travel overseas during the 18th and 19th centuries was long and hazardous. No matter how the visit went, King Kalakaua’s trip would set a precedent. The result was America’s first state dinner with a foreign head of state, an intimate but elaborate meal consisting of more than 20 courses and 36 guests. The president, vice president, and a host of other U.S. dignitaries were in attendance. One reason that official state visits are rarer is because they require ample time for planning and preparation. Everything from the 21-gun salute at the arrival ceremony to the seating arrangement at the dinner is meticulously coordinated. The formality of state visits is both a way to honor the leaders of foreign countries and to pay homage to America’s own distinctive customs. The crown jewel of the visit is the state dinner. The president and first lady greet the visiting head of state and his or her spouse at the White House north portico before leading them upstairs to the Yellow Oval Room. Upstairs, they often tour historic rooms in the private residence. Other guests enter through the East Wing to the State Floor, awaiting the guests of honor’s entrance down the Grand Staircase. Grisham said the state dinner would reflect the first lady’s style and her role as spouse of the leader of the free world. “She has a solid grasp on all of her roles, which include mother, wife and first lady of the United States, both public-facing with events and engagements and behind-the-scenes with the renovations and preservation efforts at the White House,” Grisham said.